Pacer corrosion resistant gasoline engine driven self priming 2" plastic water pump with 5.5 HP Lifan gasoline engine. Suitable for water (clean or dirty) and many agricultural chemicals, such as Nitrogen, Roundup, Atrazine and many other chemicals. Self-priming to 20 feet. Pump mechanical shaft seals are not warranted under any conditions. Engines must be taken by buyer to a local engine warranty station for warranty issues. The Pacer Pump 2" Hose Accessory Kit # P-58-0206 comes with PVC suction hose 2" X 20' with quick couplers; PVC discharge Hose 2" X 25' with quick couplers # 58-2132-025; 2" Plastic Street Elbow # 58-0752-40; two 2" Type F Plastic Male Quick Coupler # 58-1456; a suction strainer # 58-0733; teflon tape. 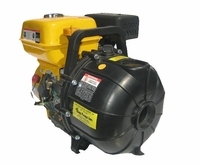 Accommodates Pacer pump with engines up to 8-HP, lightweight design for easy unit handling and portability. Rubber feet provide traction and minimize vibration. Black epoxy coating. Dimensions: 24.5"L x 9.5"W x 17.5"H. Weight: 10.8 lbs. Note: Includes roll cage, rubber feet and mounting hardware. A pump cart accessory kit for those who need to move their pump often, or simply find the pump too difficult to carry. The kit includes everything you need to mount an existing pump to the cart, and will accommodate most pacer gas engine driven pumps up to 6.5 HP. Assembly is required. Does not include pump.